The present Kneller Hall is the third house to have occupied this site. The first large house was that built by Edmund Cooke between 1635 and 1646 and assessed for 20 fireplaces for the Hearth Tax of 1664, making it the fourth largest house in Twickenham. The house had a series of owners in the second half of the 17th century including Charles Pitcairne, Sir Thomas Mackworth and Henry Kempe Esq. The house was bought by Sir Godfrey Kneller in 1709. He demolished the old house and built his own from, it is reputed, drawings by Sir Christopher Wren. The only print of the house built by Kneller, was drawn by Kip in 1716. It shows a small elegant house in the Queen Anne style. The Hall and staircase was painted by La Guerre with some assistance from the master. In building the house Kneller had the road outside diverted, previously it had gently curved past the property whereas it now follows a zig-zag route. 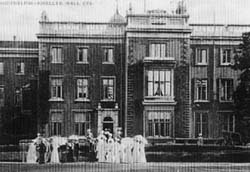 Kneller spent the summer months at Whitton, visited and courted by many people of distinction and honour including members of the Royal Family. After Sir Godfrey’s death the hall passed to his widow Susan Lady Kneller for her lifetime. The house, then called Whitton Hall, now became known as Kneller Hall. On his widow’s death in 1729 the estate was inherited by his grandson. Kneller, before his marriage, had enjoyed a liaison with a Mrs Voss. Agnes, a daughter of this liaison, married a Mr. Huckle and their son Godfrey Kneller Huckle was Kneller’s ultimate heir. Godfrey Kneller Huckle was never to live in Whitton having married the heiress to an estate at Donhead in Wiltshire, where he went to live. So Kneller Hall was leased out until 1757 when it was sold to Sir Samuel Prime, a prominent London lawyer. Sir Samuel and his son Samuel extended the hall greatly, Samuel junior having a large family. The walls around the house were pulled down, several houses opposite the entrance were demolished and the pleasure ground extended across the main road towards Twickenham, until by 1818 the grounds extended as far as the present Chertsey road. The grounds were also 'improved' under the Primes. 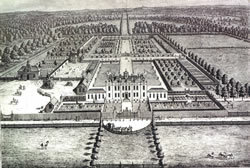 Kip's engraving shows a formal garden popular in the early 18th century, but the Primes had it altered to a much less formal appearance, with a lake behind the house fed by an old stream that ran through Whitton. Many postcards dating from the early years of the century show how the grounds would have appeared in the 19th century. Samuel Prime junior died in 1813 and to settle his affairs the hall was sold to Charles Calvert, of a wealthy brewing family and Whig member of Parliament for Southwark from 1812-1832. He expanded the house under the supervision of Philip Hardwick by adding a spacious drawing room at the east end and a large drawing room at the west end. Charles Calvert died of cholera in 1832, his widow living on in the house till her death around 1845. The hall was then acquired by the Government as a training college for teachers of pauper and criminal children. The present appearance of the house dates from the rebuilding which took place between 1847 and 1850. The walls and timbers of the Kneller house were found to be dilapidated and this part was taken down. The sections added by Charles Calvert formed the wings of the new house though refaced, and raised to carry two dormitories, with a new central block. This, replacing the part built by Kneller, was designed by George Mair, based on Wollaton Hall. The servants quarters added by the Primes on the north west wing of the house were extended at the same time. The house is of red brick, faced with Bath stone with a plinth around the base of Portland stone. Nothing now remains of the original Kneller house. The Hall was opened as the Training School in 1850 with Dr. Frederick Temple as Principal and Francis Palgrave as his deputy, with room for about one hundred pupils. The training school was not a success, there was controversy over its use in the educational field, and it was closed in 1856. This did no harm to the careers of the two principals: Dr. Temple was to become Archbishop of Canterbury and Francis Palgrave was later to edit that Victorian favourite the Golden Treasury. The Hall was then acquired by the War Department as a school for army bandsmen. This was just at the end of the Crimean War and as it had been noticed that the bands in the army regiments were full of German musicians, it was thought that native bandsmen should be recruited. So under the auspices of the Duke of Cambridge, Commander in Chief of the Army, the school was opened as the Royal Military School of Music on 3 March 1857 and has remained so to this day. 1632	Edmund Cooke buys two small houses and various lands from Lady Ursula the widow of Sir Simon Harvey. 1642	Death of Edmund Cooke, the new house and land inherited by his wife Frances. 1653	House described as a Mansion. 1662	Charles Pitcairne sells the house to Sir Thomas Mackworth, Bart. 1670	Henry Kempe, a lawyer of the Inner Temple buys the property. 1685	Captain Piercehouse buys the property. 1696	Peter Martell the owner. 1699	Tracey Pauncefoot acquires the property though a recovery in the Isleworth Syon Manor Court. 1709	Pauncefoot sells the house to Sir Godfrey Kneller. Kneller demolishes the old house and builds a new house in the Queen Anne style, completed by 1711. Known as Whitton Hall in his lifetime and after his death as Kneller HaIl. 1723	Death of Sir Godfrey Kneller, house to his wife, Susannah Lady Kneller for her lifetime. 1729	Death of Lady Kneller, the property inherited by Godfrey Kneller Huckle (who changes his name to Godfrey Kneller Kneller), he was Godfrey Kneller's grandson by his illegitimate daughter Agnes Voss. 1731	House leased by Godfrey Kneller Kneller to Eleanor Verney, widow of a Warwickshire gentleman. 1757	Sir Samuel Prime buys the house from Godfrey Kneller Kneller. 1777	Death of Sir Samuel Prime, his son Samuel Prime inherits the house. He makes many additions and buys large areas of land opposite the house, which he makes into a pleasure ground. 1813	Death of Samuel Prime Esq, estate inherited by his younger son Richard. 1818	Richard Prime sells the estate to Charles Calvert, M.P. for Southwark. I 820	Charles Calvert adds an East and West wing. 1846	Morris Emmanuel buys the estate. 1847	Kneller Hall and the land between Kneller Road and Whitton Dene is sold by Emmanuel to the Committee of the Privy Council for Education. Kneller's house is demolished, except the wings added by Charles Calvert, a new centre section, modelled on Wollaton Hall, Nottingham, is erected, with the recently added wings raised to three stories. 1850	The Kneller Hall Training School for the Teachers of Pauper and Criminal Children is opened with Dr. Frederick Temple as Principal, and Francis Turner Palgrave as Vice Principal. 1856	The Kneller Hall Training School closes after Dr. Temple resigns. 1857	The house transferred to the War Department opens as the Military School of Music. 1957	100th Anniversary of the School of Music is celebrated with a visit from the Queen.